Since the Town Lodge Motel closed in Downtown Las Vegas, it has turned into a bit of an urban showcase. The motel itself is considered to be an art museum, having been the canvas for more than 100 artists. Amongst the Las Vegas street art for the Life is Beautiful art and music festival, the Art Motel has potentially become the biggest tradition. It all started in 2014 when Irish artist Maser turned the Town Lodge Motel into what can be likened to a Dr. Seuss nightmare. The whole building was painted with bright, vivid colors in completely symmetrically striped patterns. Each section had a color theme: blue and white; red and yellow; blue and black; etc. All the colors next to one another were in complete contrast, making it stand out against each other. In the motel’s courtyard, the same thing was done. Rectangular structures and gigantic blocks were set up next to each other with the same sort of design. Maser even brought in a really cheap Craigslist-purchased van, parked it and painted it. The whole thing together looks like a little slice of another world, hidden within the courtyard of a run-down motel. By taking these otherwise normal structures and painting them the way he did, he created a feeling of surreality from which you can’t look away. The Art Motel is updated every time the Life is Beautiful festival hits Downtown Las Vegas. 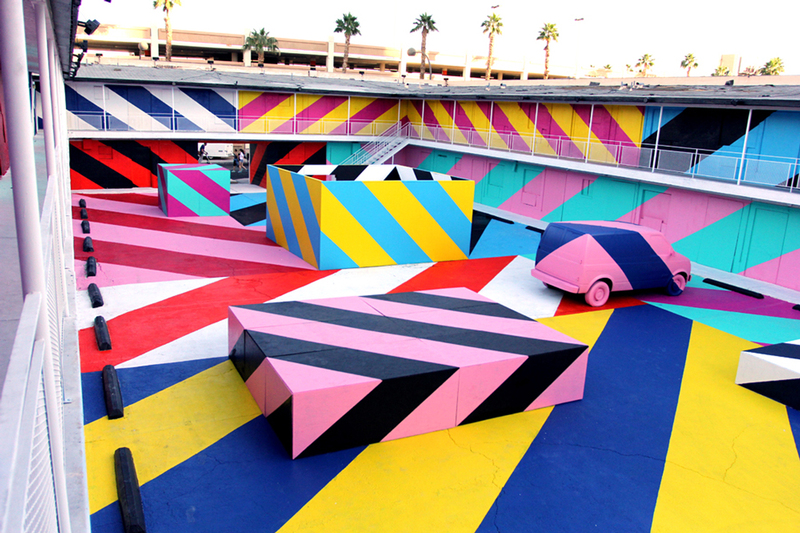 A year after Maser turned the abandoned motel into a colorful and striped venue, the motel was subjected to the wrath of over 100 artists, including a robot who left the confines of the UNLV labs to express itself. These murals covered the motel from one end to the other—different artists, different expressions. All beautifully done. If you’re a fan of Las Vegas murals, take the Vegas Pub Crawler through Downtown Las Vegas, and experience them firsthand. Las Vegas street art still paves the streets even long after the Life is Beautiful festival, so book your experience with us tonight and view the DTLV street art!